So, phase one of our build is complete. Or at least it would be if we were professional enough to have split it into phases. What I’m trying to say is that the roof is finished. And it looks amazing, both inside and out. I feel genuinely proud of it. I know I didn’t actually build it (you really wouldn’t want to spend any time under a roof built by me…) but it still feels like we ‘created’ it, and that’s good enough for me. 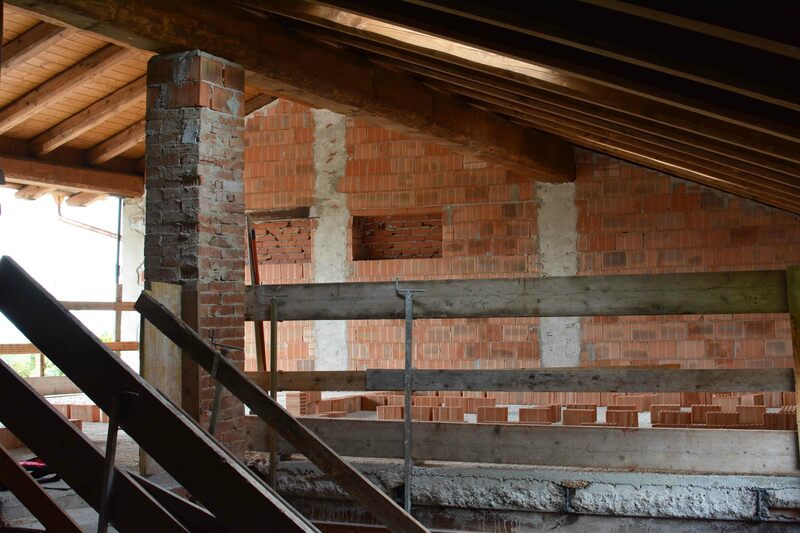 We’ve done away with the two different levels and the strange sticky-out bit, opting to raise the whole roof to level of the higher original section. We’ve also got rid of all the asbestos, replacing it with reclaimed tiles, and added a few skylights and a couple of Sun Tunnels. These look a bit more futuristic than I expected, but I think that works, putting the new and the old together. We’re renovating now after all, in 2014. We want to preserve, and even highlight, the old, but that doesn’t mean we can’t add a few modern touches that make living in the building that bit more pleasant. Inside, the wood will remain on show. Some of the beams are basically just huge tree trunks. It looks incredible, if I say so myself. As for us, we’re back in Novello again, hopefully for a bit longer this time. We’ve been spending our days mapping out all the dividing walls with bricks and, in the process, destroying all our architect’s well thought-out plans. 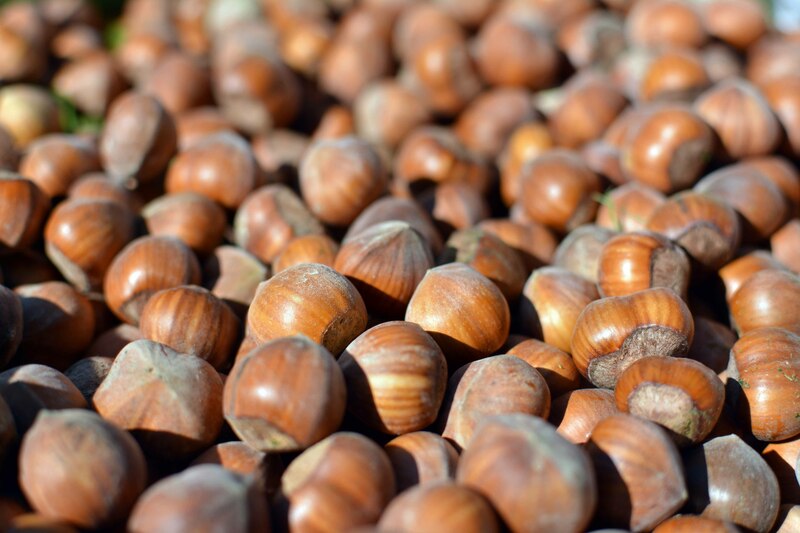 Also, I have very good news for anyone who likes Nutella (which is basically everyone)… there may be talk of a hazelnut shortage, but having spent two days crawling around under our nut trees, I’m happy to confirm there is no shortage here in the Langhe. If anyone from Ferrero would like to buy some hazelnuts for a massively overinflated price, please contact me. Oh, I am so glad the renovation is now moving right along! I feel like I have been building, and fretting, but not spending, right along with you! That’s great news. Won’t belong till you’ll be living the dream. Don’t go getting my hopes up… there’s still a lot to do. I’m really happy with how it’s looking though! Having renovated, I know it is exciting to have the roof done, because it starts to look almost like it could one day be a house again, then. Thanks!! The rest is a bit less interesting right now, but hopefully there will be stuff to show you soon! Whohoooo! Great news!!!! A real house is coming right along! Love all those hazelnuts! yum! Thanks! Much as I’m enjoying the process I really can’t wait for it to be finished!! Uggg…I can only imagine! I have NO PATIENCE for this type of thing…although somehow we always buy a house we have to redo!??! Anyway…it will be beautiful when it is finished and completely satisfying. Hang in there! The roof looks great! And I haven’t heard of the hazelnut shortage (I suppose it has something to do with the weather this year? ), but since we’re hazelnut paste snobs, that stuff by Ferrero never touches our lips! Ooooh. Did you have a “The roof is done” party? No, but we really should have! We’ll definitely have a ‘whole house is done’ party some day though!! Those reclaimed tiles look fab – reinstated to their former glory. 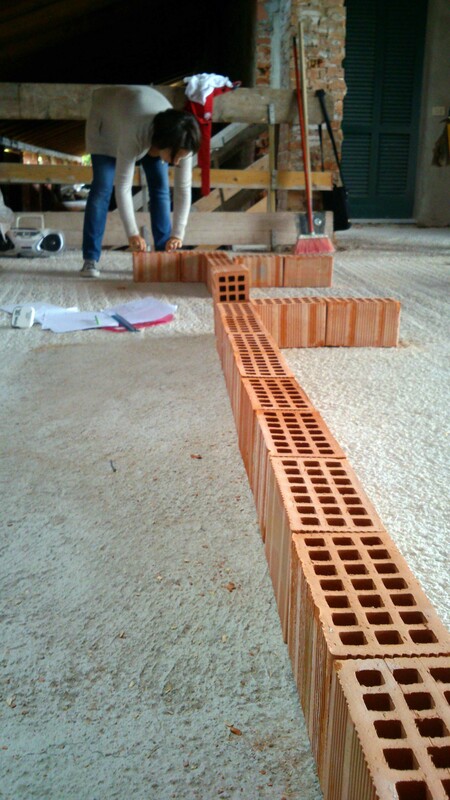 It looks like you are playing grown-up Lego with those bricks. I want to play too. Or I’ll play with Bee whilst you play Lego. Thanks MM! I think Bee is going to be an architect when she grows up… all this exposure to building at such a young age is surely having some sort of effect. Or maybe she’ll be a bricklayer! Amazing news! Good job then!